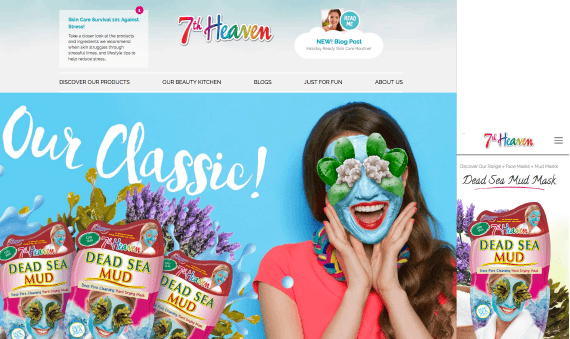 Selling 35 million sachets a year in 87 countries, the multi-award-winning global beauty brand 7th Heaven boasts a range of 100% natural, vegetarian and animal-friendly makeup products. Founded by Gregory Butcher in 1985, Montagne Jeunesse (French for mountain of youth) rebranded in 2015 with a fresh new name and a colourful new look. 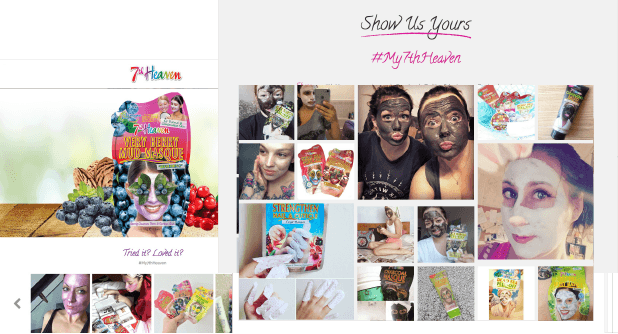 No stranger to breaking ground as the first to offer Facemasks in a sachet, 7th Heaven refocused their digital presence on brand awareness and engagement pushing their sales efforts towards the support of their worldwide network of stockists and distributors. They are still the world’s number one face mask! My7th had previously had a basic eCommerce store design as the main site. It provided little opportunity to have fun, was hard to use and even hard to update. With big plans, and full of excitement from the brand the team wanted to activate fans and show stockists that My7th was a fun, ethical and engaged brand that would drive participation and sales in-store. The strategy for the next year was to roll out a new website, into multiple countries and multiple languages but the existing website was boring, too hard to use and not engaging their audience. Top of the bill was to make the site engaging, keep the attention of the audience, and show the love. Rixxo integrated the Wyng platform into an easy to use CMS system and reinvented the website for sensory rich user engagement. We added enhanced product tagging that allowed social posts from the global account to be filtered onto their regional sites. Not content with just one engagement tool we built a product selector to help fans discover the perfect products for their skin, an easy to navigate catalogue with dynamic links to stockists, and a clear navigation system that took you on a journey of discovery through the site. Behind the scenes we increased load times and reduced the weight of pages to give mobile users an outstanding experience, created an in-store product selector microsite, and embarked on our journey of translating the site in more than 20 languages. It’s been a great journey so far and one that will continue. The brief: A sensory and experiential website to push the brand further and increase SEO ranking after a rebrand. Rixxo was referred by a partner of 7th to discuss how user-generated content could be harnessed within a website to create an engaging website experience. 7th knew their perfect profile was looking at the website one mobile device but they didn't stick around long. We created multiple user journies through the site and social networks to engage audiences for longer and increase the page views and dwell time. To increase the time on the site and the number of pages visited we created a number of immersive experiences. You could take a quiz that recommends the perfect product to try next, share you selfie or product photos and gain some infamy either on the website or Instagram. We added a press section, a new blog and even injected user photos onto related product pages so you could see what the real world experience was like. The results speak for themselves and we continue to create and amaze with the My 7th Heaven team.